Brad Lichtfuss ’16 (left) with Erika Rettler ’16 (center) and Nicole Kozlovsky ’16. 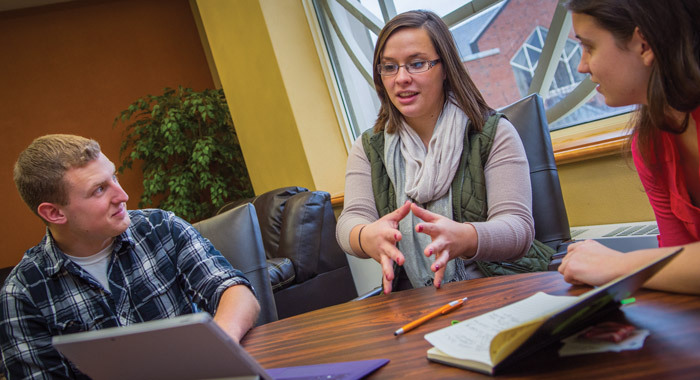 Students are leading studies that are making a significant impact in northeast Wisconsin, through work undertaken by the new Center for Business & Economics Analysis (CBEA) at St. Norbert. The new center gives students an opportunity to use what they’ve learned in the classroom to help develop solutions for community problems and issues, at the same time strengthening the ties between the college and the regional business community. “It’s been wonderful to be a part of. I’m using what I’ve learned to work on a real-world issue and also gaining new skills along the way,” says Brad Lichtfuss ’16. “At the end of the day, I feel like I’m giving back.” Lichtfuss studied areas facing a shortage of teachers, such as inner city and rural schools, looking at possible ways they could attract and retain educators. Like all the projects at the CBEA, his results were shared with community leaders. 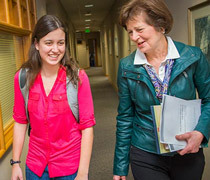 Students are selected by professors to participate. They can earn an independent-study credit for their efforts but, to Erika Rettler ’16, the real attraction was gaining real-world experience before leaving college. That’s something Nicole Kozlovsky ’16 has experienced. Last spring, she worked with a professor on an economic impact study for the Green Bay Botanical Gardens. After seeing the presentation, a representative from the local cerebral palsy center asked if the college could do something similar for them. This time, the project was under the auspices of the CBEA, and it was Kozlovsky herself – not a professor – who took the lead. While Kozlovsky, Rettler and Lichtfuss are all pursing majors within the Schneider School, co-director Jamie O’Brien (Business Administration) said the CBEA is open to students of all majors interested in addressing real-life issues. “We’re all about getting skill sets together to solve problems,” he says. The Center for Business & Economic Analysis has three main focuses: student-led research projects, community presentations and white papers on various topics.The initiative came into being as co-directors O’Brien and Marc Schaffer (Economics) were discussing project work (in O’Brien’s classes) and community presentations (in Schaffer’s). Their vision for a center, to be housed within the Schneider School of Business & Economics, grew with the support of college administration and staff. Erika Rettler ’16 grew up in the New North – the 18-county economic development region in northeast Wisconsin – so when she had the opportunity to use her research skills to help develop an innovation index through the CBEA, she jumped at the chance. Rettler researched various economic factors that make a region appealing to entrepreneurs. She then measured those factors in the New North and compared them to other parts of Wisconsin, the state as a whole and then the country. The information gathered will help the New North to develop marketing materials to lure entrepreneurs and start-up businesses to the area. CBEA research by Nicole Kozlovsky ’16 for the Green Bay Botanical Gardens was the subject of an article in the first issue of SyNC, a new publication connecting northeast Wisconsin business with St. Norbert College. You can enjoy the magazine online and subscribe to print and/or online issues. Find us on Facebook, follow our blog or subscribe for monthly emailed updates via @St. Norbert.